Hidden among the short grass on stony hillsides and mountains, Spring Gentians often go unnoticed, but when you do find them they stop you in your tracks with their startling deep blue flowers. Rarely growing taller than 5 to 10cm, Spring Gentians are characterised by brilliant blue flowers typically 15 to 20mm across and 20 to 25mm long with five fused petals and smaller fused sepals. The leaves are elliptical to lanceolate and occur in two or three opposing pairs along the stems each with a single stalked flower that opens only on bright sunny days. 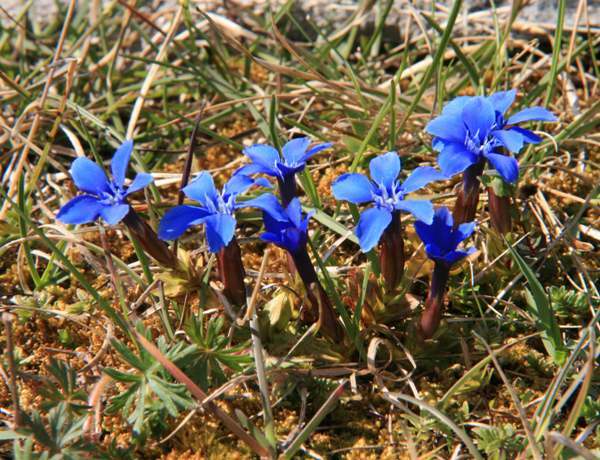 In Ireland Gentiana verna is found in The Burren, an area of limestone pavement in County Clare. Unusually, this Arctic-alpine wildflower occurs there right down to a few metres above sea level. In northern England Spring Gentians are known to occur in Teesdale - for example at Wynch Bridge - but they have not been recorded recently in any other parts of Britain. 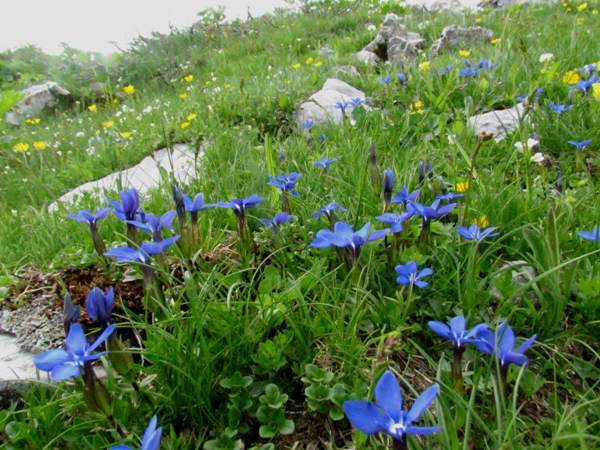 Spring Gentians are widely distributed in mountainous limestone regions of central Europe and parts of Asia; we have seen great carpets of these lovely wildflowers on Vogel Mountain in Slovenia, and in Austria, Switzerland and Italy too. Gentiana verna requires short-sward grassland on chalk or on limestone; it copes well with exposure to full sunshine but can also be found in lightly shaded locations. Overgrazing is a serious threat to this rare (in many countries including Britain and Ireland) wildflower. 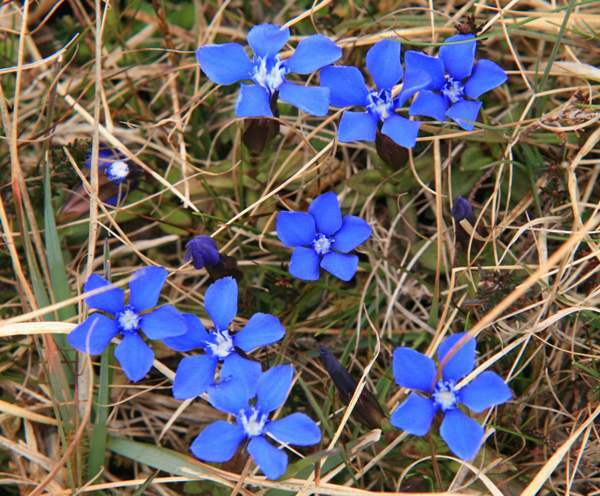 Spring Gentian blooms from April until June, depending on altitude and sunlight exposure. Despite their great beauty, Spring Gentians were considered unsafe for anyone to pick and bring indoors; the belief was that to do so would greatly increase the risk of that person being struck by lightning. There can be no substance to this superstition, of course, but it must have helped contribute to the survival of this rare wildflower. 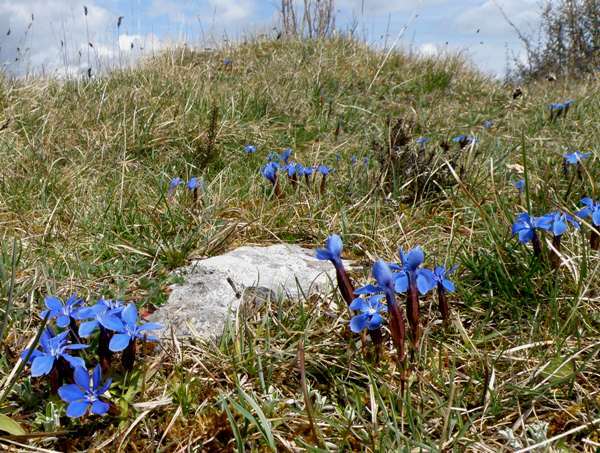 Spring Gentians in The Burren, Ireland. Gentiana verna was voted as the county wildflower of County Durham, in England. Gentiana, the generic name, was given to this group of plants because reputedly in the 6th century King Gentia of Illyria used extracts from the roots of Yellow Gentian Gentiana lutea to cure his troops of malaria. The specific epithet verna means of springtime. There are several blue gentians - for example in North America Gentiana parryi grows in alkaline meadows in the Rocky Mountains. Other gentians include the Field Gentian, Gentianella campestris, which flowers from July until October in lowland gassy areas and on dunes, and the Marsh Gentian, Gentiana pneumonanthe. The photographs of Spring Gentians Gentiana verna shown on this page were taken in The Burren during May and in the Julian Alps, Slovenia in mid June.